Hear from head coach Bob Lilley, as the club heads into a two-match weekend. 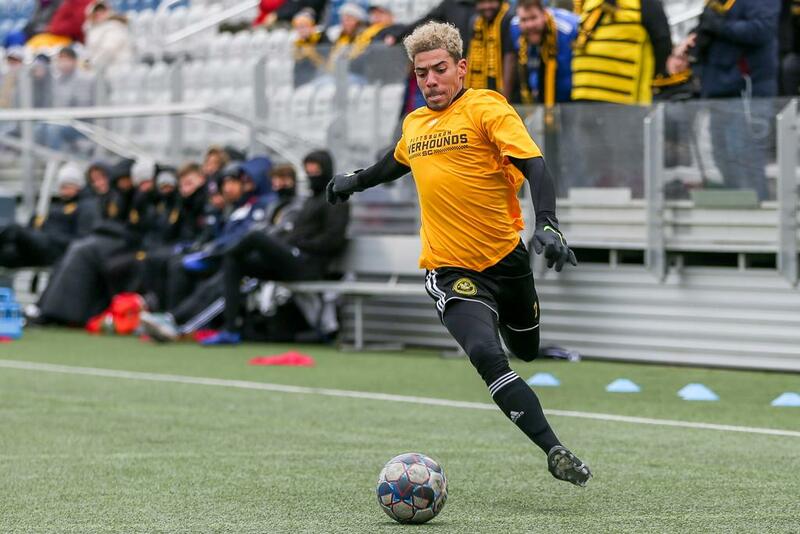 The first day of camp can be the light at the end of the offseason tunnel for a lot of players who yearn for the game of soccer, but one member of Pittsburgh Riverhounds SC especially craved the ability to once again to take the pitch at Highmark Stadium. In 2018, Dabo’s passion for the sport radiated, perhaps no more than during his celebration of his first career goal (seen above). And when he stepped onto the pitch, it was hard to remove him from between the lines. During a 16-game stretch to close the campaign, Dabo played 1,367 of a possible 1,440 minutes. Even though the Senegal native could not play competitively this offseason, he still found ways to participate in the sport he is ever so passionate about. As Dabo shares the love he has for the game through coaching others, his fire is felt by his Hounds teammates and coaching staff. Heading into the 2019 season, Pittsburgh will continue to rely upon his palpable soccer affection. Last year, the opposition felt this punch consistently throughout the season. The 5-foot-9-inch Dabo, excellent at obtaining loose balls in the midfield, won a whopping 71 percent of his tackles. Kyle Morton picked up right where he left off. 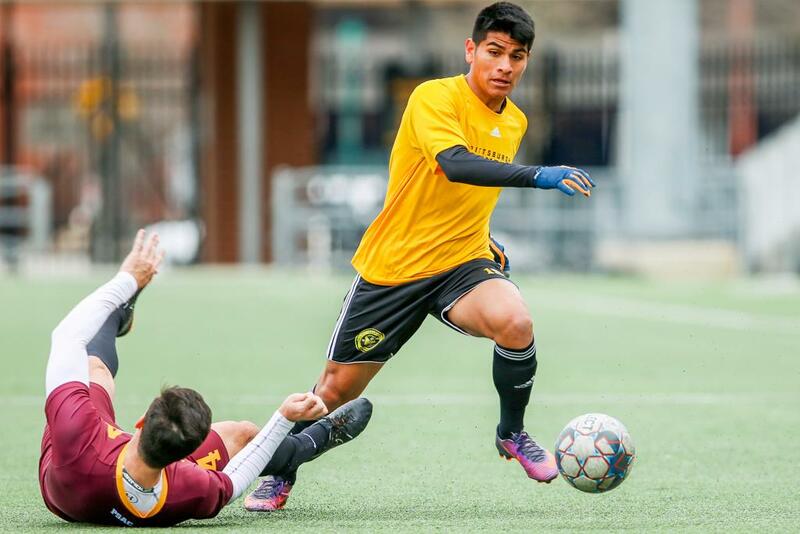 In his first match since sustaining a season-ending knee injury last spring, the goalkeeper logged a clean 45 minutes of play in Pittsburgh Riverhounds SC’s 6-0 win against Gannon University on Sunday. And like all three of his starts in 2018 – also being the first three starts of his professional career – he kept the sheet clean for the Hounds. The road to recovery for Morton has been a long one, as he was initially relegated to rehabilitation work and observation after his injury. Along the way, the West Chester, Pennsylvania native relied a lot on the guidance of goalkeeping coach Hunter Gilstrap. Morton said Gilstrap helped him visualize correct positioning and tactics throughout last season. As he progressed with his recovery, he and the goalkeeping coach continued to build upon his rehabilitation process to the point that they trained together for a couple days per week this past offseason. This weekend will present another chance for Morton to familiarize himself in a competitive game environment. The Hounds will first clash with Duquesne University at 7 p.m. on Friday before battling the University of Charleston (WV) at 2 p.m. on Sunday. Both games will take place at Highmark Stadium and both are free to attend for the public. Get to know newcomer Anthony Velarde. He had just signed on Thursday, but Christian Volesky made his presence known in his first-ever game wearing Black and Gold. Just four minutes after the start of the second half, the striker beat the Gannon University goalkeeper by lofting a soft shot up and over his frame. 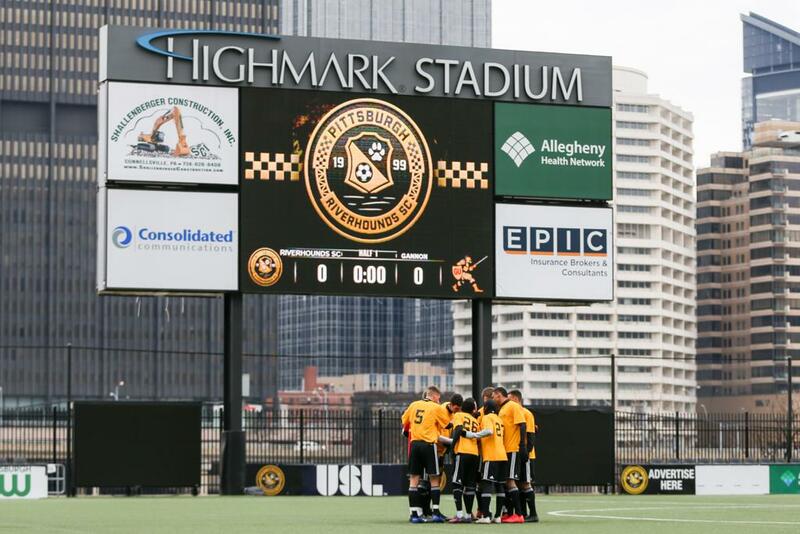 This tally was part of an onslaught, which saw Pittsburgh Riverhounds SC roll to a 6-0 victory on Sunday at Highmark Stadium. Volesky was not alone in participating in his first game with new teammates this past weekend. 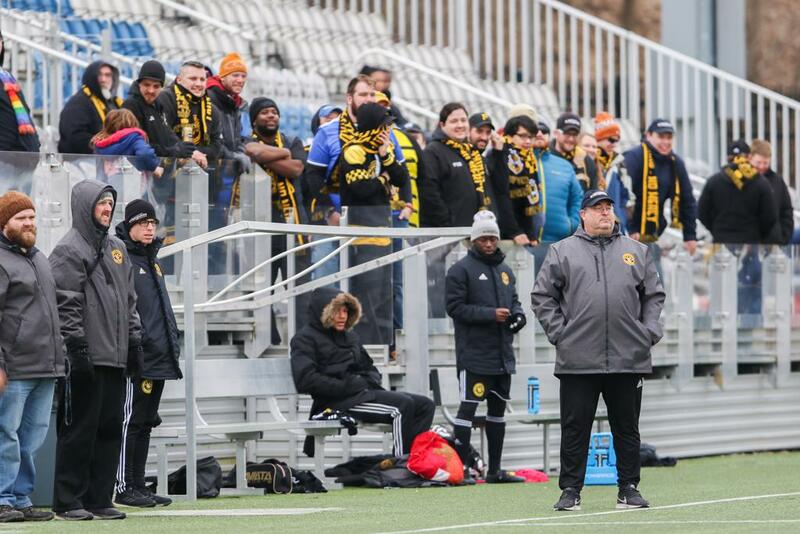 As the Hounds currently have 14 players under contract, the team is working to develop chemistry with signed athletes as well as evaluate talent from an additional number of trialists. In the team’s preseason opener on Friday, it did not possess the same offensive firepower displayed in its 6-0 victory on Sunday. 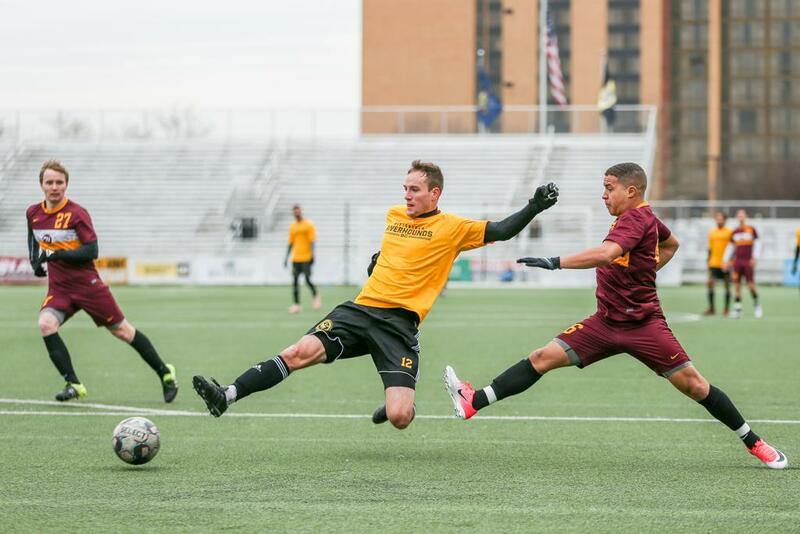 Pittsburgh did not pot its game-winning tally, courtesy of trialist Mark Forrest, of its 1-0 win against Cleveland State University until the 84th minute. “I’m happy with the level of guys we have in here, but we still have a lot of work to get to our final decisions,” Lilley said. Beginning their second week of training on Tuesday, the Hounds will look to further build on the chemistry of the group. Like the first week of camp, the team will be split between contract players and trialists in its second week of action.